In vehicular ad hoc networks (VANETs), the efficient and reliable dissemination of emergency messages in a highly mobile environment under a dense or sparse network is a significant challenge. This paper proposes a robust broadcast scheme for VANETs, called the virtual slotted p-persistence scheme, which operates efficiently regardless of the vehicle density and distribution. Via the exchange of hello messages, each vehicle maintains position information on neighbor vehicles in a neighbor table. When a vehicle receives an emergency message, it determines its vehicle group, called a virtual slot, based on the position information in its neighbor table. The proposed scheme guarantees that the vehicles in the farthest group from the broadcaster probabilistically rebroadcast the message first. Simulation results demonstrate that the proposed scheme outperforms the slotted p-persistence scheme in terms of the end-to-end delay, collision ratio, and network overhead, regardless of the vehicle density and distribution. Vehicular ad hoc networks (VANETs) have recently emerged as a promising field of research for increasing road safety by enabling drivers and/or vehicles to communicate with each other . Most current applications targeting VANETs rely heavily on broadcast transmissions to disseminate safety-related information, such as look-ahead emergency warnings and information about unsafe driving conditions. Yet, broadcasting messages blindly can lead to frequent transmission contentions and collisions among neighbor vehicles. This problem is known as a broadcast storm . This paper focuses on the broadcasting of emergency messages for safety applications. When designing an efficient and reliable broadcast protocol for VANETs, the broadcast storm problem must be considered. One solution to alleviate the broadcast storm in a VANET is to have the farthest vehicle from the broadcaster perform the rebroadcasting, and various broadcast storm mitigating schemes have already been proposed in [2–12]. The weighted p-persistence scheme  and the slotted p-persistence scheme  are representative examples of these broadcast approaches. The weighted p-persistence scheme assigns a higher probability to vehicles that are located farther away from the broadcaster and the slotted p-persistence scheme divides the transmission range into a pre-determined number of slots and assigns the pre-determined probability at each slot. However, these schemes have some problems. In a dense network, multiple vehicles may rebroadcast the message simultaneously, resulting in collisions. Also, in a sparse network, the waiting time can cause a long delay before the message is rebroadcasted. These mean that the performance of existing broadcast schemes is highly dependent on the vehicle density and distribution. Accordingly, this paper presents a robust broadcast protocol for VANETs, called the virtual slotted p-persistence scheme, which operates efficiently regardless of the vehicle density and distribution. The remainder of this paper is organized as follows. Section 2 describes related works. Section 3 explains our proposed virtual slotted p-persistence scheme. Section 4 describes the simulation environment and compares the performance of the virtual slotted p-persistence scheme and the slotted p-persistence scheme. Finally, Section 5 provides some conclusions. Many algorithms have already been proposed to cope with the broadcast storm problem [2–12]. In , the broadcasting schemes are categorized into two types: sender-oriented schemes and receiver-oriented schemes. In the case of sender-oriented schemes [3–5], the sender uses neighbor position information to select the farthest vehicle as the next forwarder. The advantage of sender-oriented schemes is that only a single vehicle rebroadcasts the message. Meanwhile, receiver-based schemes [6–12] use contention to automatically select the next forwarder(s) in a distributed fashion. All the one-hop receivers of an emergency message enter a contention phase after receiving the message. After a waiting time, which is calculated using the distance from the broadcaster, the message is rebroadcast. One of representative receiver-oriented approaches is a probabilistic scheme, where vehicles rebroadcast a received message using a predetermined probability. For example, Wisitpongphan et al. proposed the weighted p-persistence scheme and slotted p-persistence scheme as probabilistic broadcast suppression techniques . In the weighted p-persistence scheme , the rebroadcast probability p of a vehicle is calculated using the relative distance between the vehicle and the broadcaster. This scheme assigns a higher probability to vehicles that are located farther away from the broadcaster. Meanwhile, in the slotted p-persistence scheme , the transmission range of the broadcaster is divided into a pre-determined number of slots and a vehicle rebroadcasts the message using the pre-determined probability p at the assigned time slot according to its location within the slots in the transmission range. Each vehicle uses global positioning system (GPS) information to calculate the waiting time before broadcasting. The authors in  showed that, when compared with the weighted p-persistence scheme, the slotted p-persistence scheme could further reduce the broadcast redundancy and packet loss ratio for most multi-hop VANET applications. Figure 1 and Figure 2 illustrate the rebroadcasting operation of the weighted p-persistence scheme and the slotted p-persistence scheme respectively. Rebroadcasting operation of the weighted p -persistence scheme. Rebroadcasting operation of the slotted p -persistence scheme. However, the performance of the slotted p-persistence scheme is highly dependent on the vehicle density and distribution [8, 9]. Thus, in a sparse network, the slotted p-persistence scheme can cause a long waiting time before rebroadcasting when no vehicles exist in the previous slots. Conversely, in a dense network, multiple vehicles in the same slot will try to rebroadcast simultaneously, resulting in collisions. Figure 3 shows the problems of the slotted p-persistence scheme. In case that slot 0 and slot 1 are empty, the vehicles in slot 2 rebroadcast the message at T=2τ. The empty slots cause unnecessary waiting delay. Also, in the case that vehicles are dense in slot 2, since all the vehicles in slot 2 try to rebroadcast simultaneously with the probability p, collisions may happen. Problem of the slotted p -persistence scheme. Several methods have already been proposed to enhance the slotted p-persistence scheme based on estimating the vehicle density using hello messages. In , a dynamic broadcast scheme is proposed to control the rebroadcast probability p according to the vehicle density. Meantime,  presents a scheme to adjust the number of slots dynamically according to the vehicle density. However, in real highway scenarios, the vehicle density constantly varies and the vehicles cannot be evenly distributed in slots. Therefore, neither approach can prevent unnecessary waiting delay before rebroadcasting due to empty slots, i.e. slots with no vehicles. Accordingly, this paper proposes a robust broadcast scheme for VANETs, called the virtual slotted p-persistence scheme, which operates efficiently regardless of the vehicle density and distribution. The proposed virtual slotted p-persistence scheme uses hello messages to periodically exchange the basic information between any two vehicles. Using the information in the received hello message, each vehicle maintains its own neighbor table. When a vehicle receives an emergency message, it determines its vehicle group, called a virtual slot, based on the position information in its neighbor table. The vehicles in the farthest group from the broadcaster then probabilistically rebroadcast the message first. This section introduces the basic operation of the virtual slotted p-persistence scheme that includes how to build a neighbor table, how to group vehicles, and the rebroadcasting procedure. The proposed scheme assumes that every vehicle has a GPS and knows its geographical position. The proposed scheme uses hello messages to periodically exchange basic information between any two vehicles. Using the information in the received hello message, each vehicle can maintain its own neighbor table. The number of neighboring vehicles around one vehicle can be easily obtained from its neighbor table.Every vehicle periodically broadcasts a hello message that includes its vehicle ID, position information, and moving direction. Each vehicle builds and maintains its own neighbor table. When a vehicle receives a hello message, it first checks whether or not the vehicle ID exists in its neighbor table. If the vehicle ID does not exist, a new entry is created and the vehicle information is stored. If the vehicle ID already exists, the position information and moving direction are just updated. 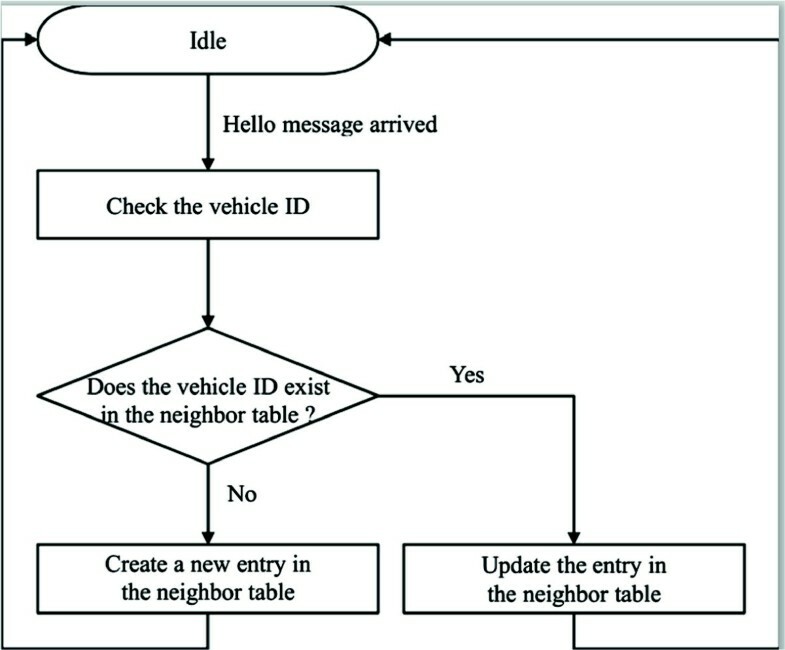 The flow chart for building a neighbor table using hello messages is given in Figure 4. The hello interval is set at 1 s to keep track of updated neighbor location information. Since many VANET applications already use hello messages, the exchange of hello messages in the proposed scheme is not an extra overhead. Flow chart for building neighbor table using hello messages. When a vehicle receives an emergency message, it determines its vehicle group based on the position information and moving direction of the neighbor vehicles in its neighbor table. In the proposed scheme, a vehicle group is called a virtual slot, as it virtually corresponds to a slot in the slotted p-persistence scheme. When a source vehicle has an emergency message to transmit, it counts the number of neighbor vehicles behind itself (N v ) using the position information and moving direction in its neighbor table. The source vehicle then broadcasts the message, including a message ID and N v . Figure 5 shows the format of the broadcast message. The position of the sender and N v are used to determine in which virtual slot the receivers are located. The data field includes information about the event, such as the position of the event, event description, and event emergency level. Upon receiving the message, vehicle i checks the message ID and N v contained in the message. If the message ID is duplicated, the message gets discarded. Otherwise, vehicle i counts the number of neighbor vehicles including itself (N i ) between itself and the source vehicle based on the vehicle position information in its neighbor table. Vehicle i is able to calculate the number of vehicles behind itself in the transmission range of the source vehicle by subtracting N i from N v . Vehicle i then finds its virtual slot number using the following equation. where τ is a predetermined slot time. When n vehicles try to transmit a message, to maximize the probability of a successful transmission without collision, the rebroadcast probability should be 1 n . Thus, the rebroadcast probability p for each virtual slot can be obtained from the following equation. Equation 3 means that the rebroadcast probability is set at 1 N s for each virtual slot, except for the last virtual slot, where it is set at 1 N v mod N s .
In the virtual slotted p-persistence scheme, upon receiving a message, a vehicle checks the message ID and determines its virtual slot number and waiting time. If the message is received for the first time and the vehicle does not receive any duplicates before its assigned time slot, it then rebroadcasts using the probability p at the assigned time slot. 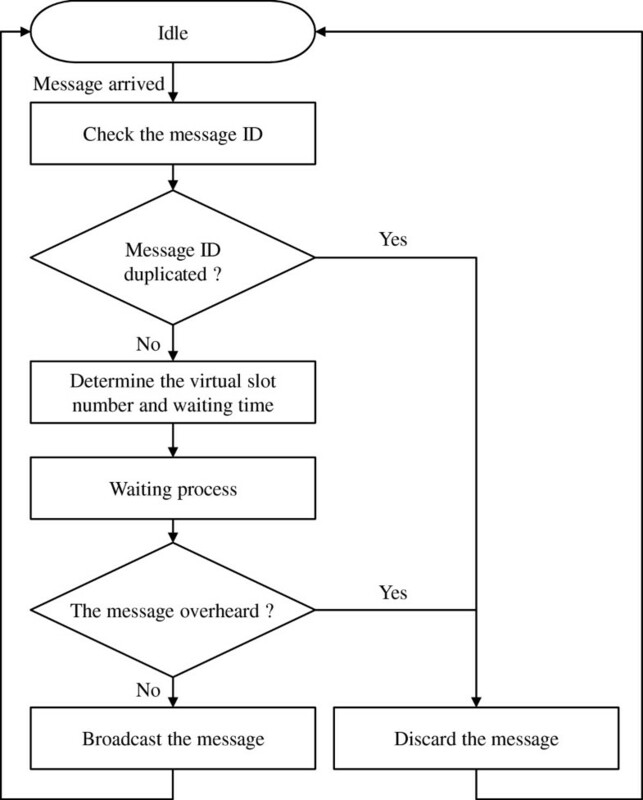 If no vehicle in a previous virtual slot rebroadcasts the message, the vehicles in the next virtual slot rebroadcast the message using probability p. The flow chart of the rebroadcasting procedure for the virtual slotted p-persistence scheme is depicted in Figure 6. Flow chart of rebroadcasting procedure for virtual slotted p -persistence scheme. Figure 7 shows an example of the rebroadcasting operation in the virtual slotted p-persistence scheme. In this case, the source vehicle broadcasts a message that includes the message ID, position of the source vehicle, and N v =11. Each receiving vehicle then checks the message ID and number of vehicles N v , in order to find its virtual slot number and determine the waiting time before rebroadcasting. In this example, N s is assumed to be 3. When the vehicles in virtual slot 0 receive the message from the source vehicle, each vehicle rebroadcasts using probability p=1/3 at T=0. If no vehicles in virtual slot 1 receive duplicates from neighbor vehicles before the assigned time slot T=1τ, each vehicle in virtual slot 1 rebroadcasts using probability p=1/3. Otherwise, all vehicles in virtual slot 1 discard the message. Example of rebroadcasting operation in virtual slotted p -persistence scheme. The performance of the proposed virtual slotted p-persistence scheme was compared with that of the slotted p-persistence scheme in terms of the end-to-end delay, collision ratio, and network overhead through a simulation using ns-2 . In the simulation, the distributed coordination function (DCF) of IEEE 802.11 was used as the medium access control (MAC) protocol, which was modeled as a shared-media radio with a 1-Mbps nominal bit rate and 500-m transmission range. To evaluate how the two schemes behaved under different vehicle densities, four traffic conditions were used: 10, 25, 50, and 100 vehicles/km/lane on a 5-km road section. The emergency message was broadcast by the source vehicle every second. The slot time τ was set at 2.5 ms and the hello interval was set at 1 s. The velocity of each vehicle was randomly selected among 80, 100, and 120 km/h. Ideally, the optimum setting for N s is 1, that is, one vehicle per slot. However, in a real environment, tolerance is required when determining N s , due to difficulties in establishing accurate position information for neighbor vehicles because of GPS inaccuracy, long hello intervals, and different vehicle speeds. In the present simulations, N s was set at 1, 3, and 5 respectively, and no GPS position errors were considered. The simulation parameters are summarized in Table 1. For the performance comparison, the following metrics were used. End-to-end delay: defined as the delay between the time the broadcast message originated at the source vehicle and the time it reached all the vehicles in the road section. Collision ratio: defined as the ratio of the number of broadcast messages lost by collision to the total number of broadcast messages. Network overhead: defined as the total number of broadcast messages incurred during a single broadcast. Figure 8 compares the end-to-end delay of the virtual slotted p-persistence scheme with that of the slotted p-persistence scheme according to the four vehicle densities. Clearly, the end-to-end delay was significantly reduced with the virtual slotted p-persistence scheme when compared with the slotted p-persistence scheme for all the vehicle densities. In the case of the slotted p-persistence scheme, under low vehicle density (at 10 vehicles/km/lane), i.e. a sparse network, there can be empty slots with no vehicles, causing unnecessary waiting delay. Plus, with high vehicle density (at 100 vehicles/km/lane), i.e. a dense network, many vehicles can be converged in one slot, resulting in collisions. However, the virtual slotted p-persistence scheme can eliminate the empty slots and has a constant number of vehicles per slot, regardless of the vehicle distribution. Therefore, the virtual slotted p-persistence scheme can reduce the end-to-end delay by avoiding the waiting time due to empty slots when compared with the slotted p-persistence scheme. 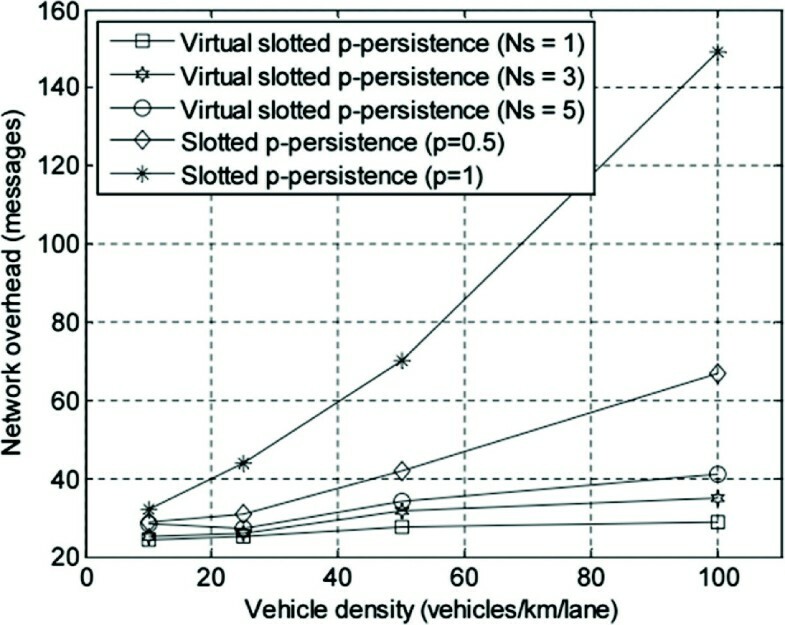 This figure also shows that the end-to-end delay for the slotted p-persistence scheme was highly dependent on the predetermined probability p and vehicle density, whereas the performance of the virtual slotted p-persistence scheme was almost insensitive to the vehicle density. 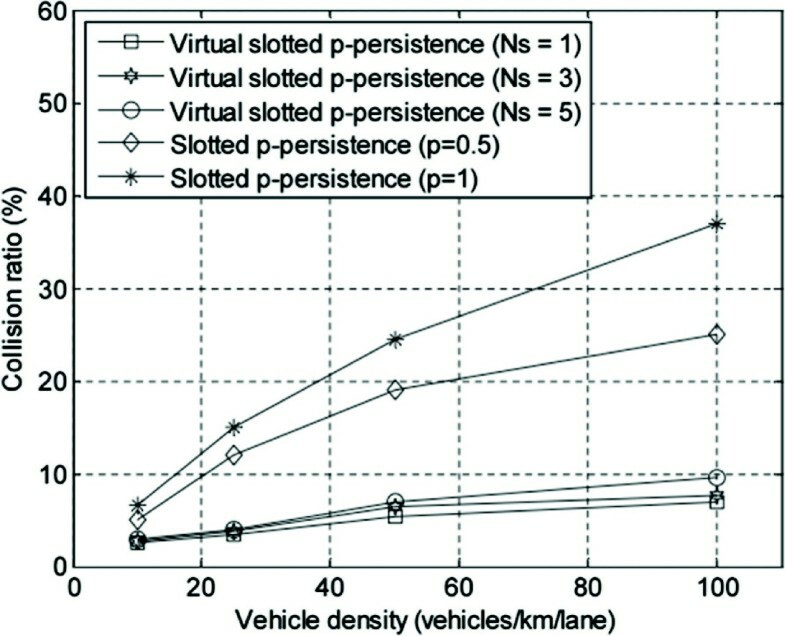 Figure 9 compares the collision ratio for the virtual slotted p-persistence scheme with that for the slotted p-persistence scheme according to the four vehicle densities. Here, the virtual slotted p-persistence scheme outperformed the slotted p-persistence in terms of the collision ratio for all the vehicle densities. 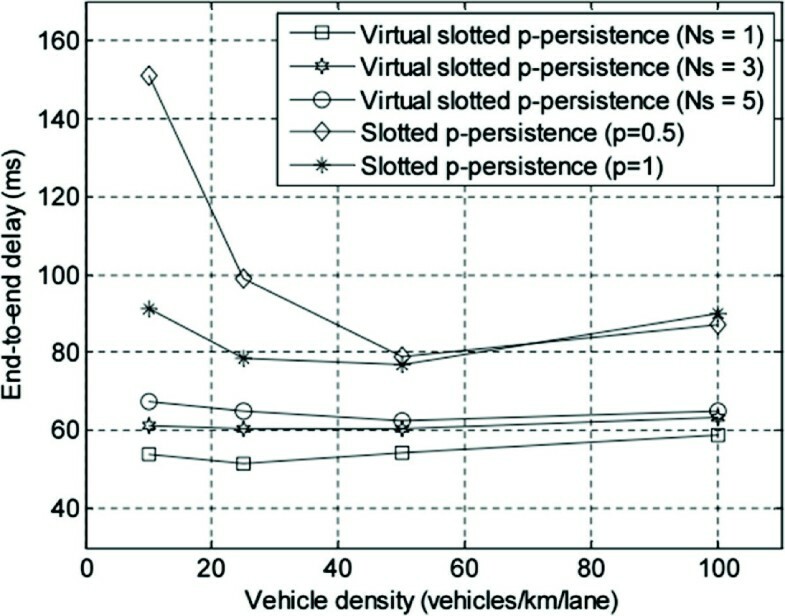 When the vehicle density increased, the collision ratio for the slotted p-persistence increased significantly, whereas the collision ratio for the virtual slotted p-persistence scheme only increased slightly. This was because, with the slotted p-persistence scheme, the number of vehicles trying to rebroadcast simultaneously in a slot increased according to the vehicle density, resulting in more collisions. Figure 10 compares the network overhead for the virtual slotted p-persistence scheme and that for the slotted p-persistence scheme according to the four vehicle densities. The virtual slotted p-persistence scheme also outperformed the slotted p-persistence in terms of the network overhead with all the vehicle densities. When the vehicle density increased, the network overhead for the slotted p-persistence increased significantly, whereas that for the virtual slotted p-persistence scheme only increased slightly. This was because, with the slotted p-persistence scheme, the collisions increased significantly according to the vehicle density, resulting in more rebroadcast messages. To identify the impact of the number of vehicles per slot (N s ) in the virtual slotted p-persistence scheme, we also have done the simulation when N s was set at 1, 3, and 5, respectively. As shown in Figures 8 to 10, the end-to-end delay, the collision ratio, and the network overhead of the virtual slotted p-persistence scheme increased a little bit as N s increased, respectively. This is because the probability that more than two vehicles in a slot rebroadcast simultaneously increases as N s increases, resulting in more collisions. Also, the collisions will increase the end-to-end delay and network overhead. 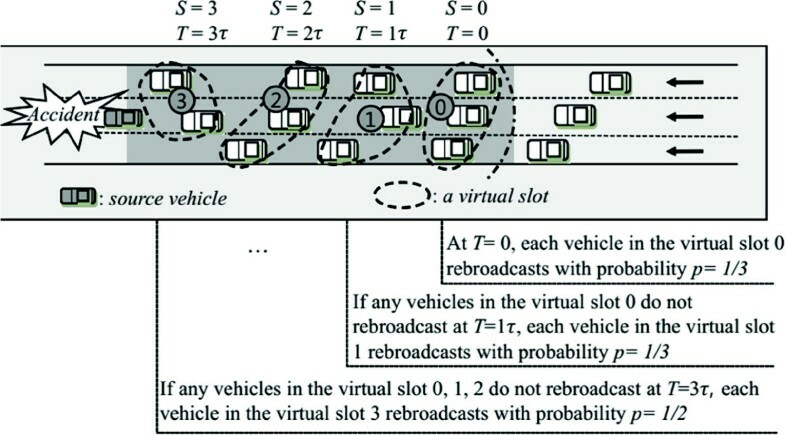 In the slotted p-persistence scheme, the number of vehicles in a slot varies according to the vehicle distribution, yet the rebroadcast probability p is pre-determined regardless of the number of vehicles in a slot. Therefore, a small probability p can result in a long end-to-end delay in a sparse network, while a high probability p can cause more collisions in a dense network. Also, in a sparse network, the slotted p-persistence scheme can cause a long waiting time before rebroadcasting when there are no vehicles in the previous slots. However, in the virtual slotted p-persistence scheme, the number of vehicles in a virtual slot can be controlled by N s , regardless of the vehicle distribution, and the rebroadcast probability p is determined optimally according to the number of vehicles in a virtual slot. This paper proposed a virtual slotted p-persistence scheme in which the number of vehicles in a slot can be controlled regardless of the vehicle density and distribution. Thus, in the case of a sparse network, the proposed scheme can avoid unnecessary waiting before rebroadcasting by eliminating the empty slots that occur with the slotted p-persistence scheme. Plus, in a sparse or dense network, the proposed scheme can reduce collisions by controlling both the number of vehicles in a slot and the rebroadcast probability p according to the number of vehicles. Simulation results demonstrated that the proposed scheme outperformed the slotted p-persistence scheme in terms of the end-to-end delay, collision ratio, and network overhead, regardless of the vehicle density. In the future work, we will consider the proposed scheme to apply for urban scenario. This research was supported by the National Research Foundation of Korea (NRF) grant funded by the Korea government (MSIP) (NRF-2013R1A1A4A01012534), and the IT R&D program of MSIP/IITP [10041145, Self-Organized Software platform (SoSp) for Welfare Devices].